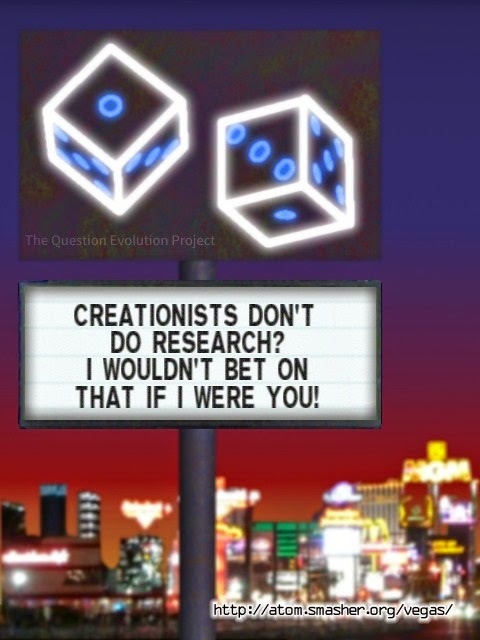 Critics of creationists will often complain that all we do is pick at flaws in evolutionary theories, so why don't creationists round up some research? Well, busting evolutionary broncos is often quite easy because Darwin's Cheerleaders frequently fail at critical thinking, and there are numerous flaws in what is considered evidence for evolution. They get ornery when we point out those things. We do many things here at the Institute for Creation Research, but the core of our ministry is original scientific research that relates to the topic of origins. We study the universe for the glory of God. We love to share our results with others and see their delight as they realize how science powerfully confirms the Bible. To that end, we publish our research in peer-reviewed science journals so that our work may be scrutinized by other scholars and any remaining problems or oversights can be exposed and removed. If none are found, we then summarize our research in lay-level literature such as Acts & Facts magazine or the various books we publish. Contrary to what is sometimes reported, we do not “try to prove the Bible using science.” We recognize that the Bible is the inspired Word of God and is thus inerrant in all its affirmations. The Bible is actually the foundation for all scientific inquiry because it delineates the necessary conditions that must exist in the universe for science to be possible and logically justified. In other words, science is possible because God upholds the universe in a consistent and rational way that the human mind can at least partially understand. We do research to honor God, expecting to learn something about the way in which He rules over creation. As Christians who love science, we are happy to join with others who share our passion such as the Creation Research Society (CRS). You can read the rest by clicking on "'R' is for Research".